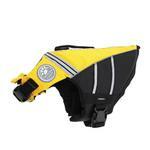 Make sure the dog days of summer are safe for pups around water with our Dog Life Jacket by Doggles - Yellow! 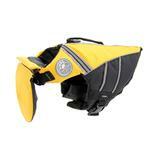 Our Dog Life Jacket by Doggles - Yellow is an all time summer favorite! Get wet and wild this summer with all your canine friends, but remember, safety first! This dog life preserver by Sierra Dog Supply by Doggles has an attachable chin float with a locking zipper to help dog's keep their head above water. 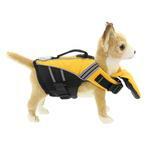 Human flotation jackets keep your nose out of the water, so why wouldn't one for the canines? Though famous for their doggy paddle, not all dogs are suited to swimming. Heavy and lean dogs and many bully breeds should not swim without a life jacket, and this one is a great choice for safety! The bright contrasting colors can be easily spotted in rough water. A low-profile handle makes it easy to lift your pup out of the water from the boat, dock or side of the pool. 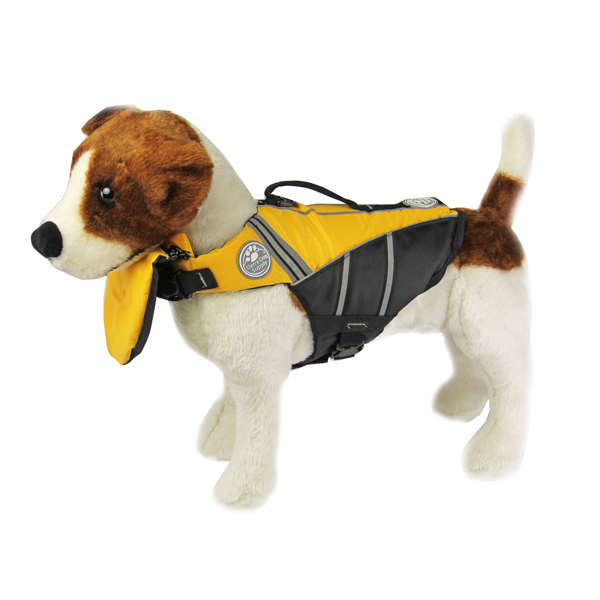 This dog flotation device also has a D-ring for leash attachment and reflective trim throughout to add even more safety features. 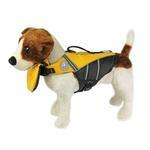 Under the durable nylon fabric are variable thickness buoyancy cells to keep your pooch afloat. It provides an adjustable ergonomic fit for all shapes and sizes. Doggles is now using earth friendly foam - no pollution in the creation or recycling process of the foam. Duraflex high-end slides and buckles are used for added safety and strength. The foam padding rests under the buckles to ensure your pup doesn't experience any chafing. Dog Life Jacket by Doggles - Yellow Customer Photos - Send us your photo! These life vests are easy to put on and ease my mind when we are near water. We use them in our backyard pool and when we go to the beach. They would be great for boating. P. Buggz in her new life jacket....she is 17 lbs, and I went by the measurements on the site and ordered her an extra-small (usually she is a medium). It fits perfectly! Cooper feels safe in the water when he's wearing his Flotation Jacket by Doggles! Murdock getting ready to float the river! Niko sporting his new Doggles Float Jacket in the Everglades! Ready to soak up some sun on the lake! Posted On 08/25/17 by Carla V. from Falls Church, VA Yes, Carla V. recommends this product! Wonderful color, true to size, and can't wait for my baby to use. Love the bright yellow color and head flotation flap on the front to keep your dog's head up while swimming (and help keep your dog from drinking salt water!). The handle on the back could be a bit thicker for added sturdiness for lifting. The size seems to run a bit smaller than indicated on the sizing chart so if your dog measures in the upper 1/3 of the size range, you may want to order the next size up. My dog was exactly in the mid-range of a small and it just fits. My dogs love their life vests. They wear them almost every time we go in the pool. It took them a little getting used to them, but now when they jump in, they love to swim around. They will be great when we go boating. Posted On 05/29/16 by Kelly O from Palm Harbor, FL Yes, Kelly O recommends this product! The life vest came promptly and was everything that was described and expected, at a great price! Can't wait to get my pup on the water! Posted On 05/10/16 by Joanne T from Jensen Beach, FL Yes, Joanne T recommends this product! Adorable, Practical and useful for so many occasions, especially with a new pool in the yard. Safety Comes First Shopping on BaxterBoo is always a pleasure, they offer value, quality and assortment for all your prescious pets. I love their 365 day return policy. Because of the amazing sales, I shop with BaxterBoo every month. Posted On 11/19/13 by Jen L from St. Thomas, Yes, Jen L recommends this product! Posted On 11/07/13 by K Kime from Harker Heights, TX Yes, K Kime recommends this product! I haven't gotten a chance to use this yet but looks well made and is well rated on Amazon. The price was way better on Baxter Boo though and I look forward to having my dog try this out in warmer weather!